You visit your dentist twice yearly and may have become pretty good friends with your hygienist. Do you ever wonder what he or she does besides clean your teeth? 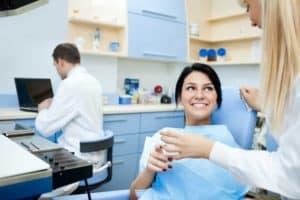 What other responsibilities do dental hygienists have? Take your Reno dentists, Dr. William Wager and Dr. Brian Evans, true or false quiz to find out what you know about the role of the dental hygienist. T or F: A dental hygienist cleans your teeth and takes x-rays and that’s about all. T or F: X-rays only show if you have cavities. T or F: Preventative dentistry is a dental hygienists major responsibility. False: It’s true your dental hygienist cleans your teeth and takes x-rays, but that’s definitely not all. The hygienist is responsible for examining your teeth and gums for the presence of oral disease, such as periodontal disease, or bodily disease which can present as abnormalities in the oral cavity such as mouth sores. False: Dental x-rays can indicate decay between your teeth, but they also show whether or not there are issues with your jaw bone, if you have impacted teeth, whether or not there is enough room for your wisdom teeth, and can indicate other issues. True:When your dental hygienist scrapes your teeth with the dental scaler, he or she is performing preventative dentistry. Hardened plaque–or tartar–which can lead to gingivitis can only be removed by a professional. Your hygienist removes bacterial plaque which is a soft, sticky biofilm, and hardened tartar deposits from your teeth to prevent periodontal disease and eventual tooth loss. Polishing the teeth smoothes the surface making it harder for bacteria to adhere, flossing removes plaque from in between teeth, and the final fluoride treatment helps keep your teeth hard, strong, and more resistant to decay. The dental hygienist can also apply sealants, a permanent plastic–like film that protects your teeth from decay.